Be compliant with standards such as ISO, OSHA, RIDDOR, COSHH, for local & international regulatory requirements. 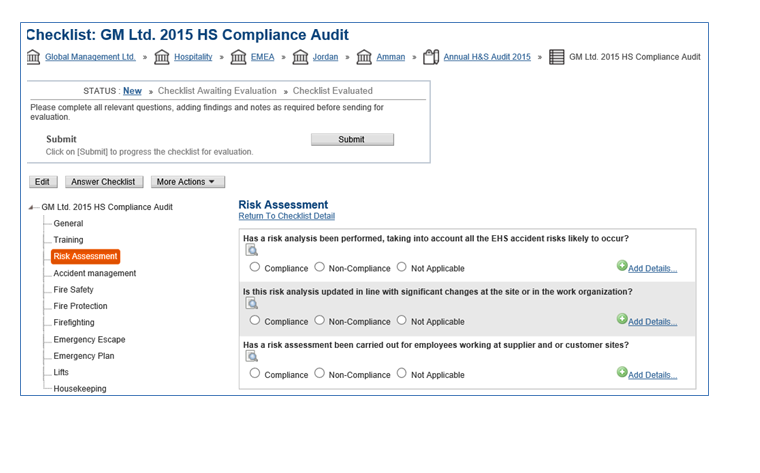 Track and manage incidents at any time with immediate root cause analysis & assessment. Establish continually updated legal compliance, using legislative checklists & country legal registers. Monitor, measure, mitigate risk with real-time status reports for any site, region, or globally. Work offline, from laptop or tablet. Zero upfront costs and quick ROI. Flexible software evolves with your changing organisational structure & regulatory requirements. Drive accountability, timescales, escalate actions with simple, powerful workflow with full activity audit trail. Report across any level of the organisation identifying trends & issues with interactive and analytical reporting. Establish user permissions & security views throughout the system. Out-of-the-box solution, more effectively managing EH&S after just 1 day. Manage all regulatory & compliance operations from a single platform. Track & manage incidents in an organised and systematic structure. Seamless data import from existing third-party systems. EHS SmartStart pricing is an annual fee. Determine how many users you need, and grow your system accordingly. All of our user-priced systems come fully-featured, so you don't miss out on any functionality. Configuration: Users, Organisational Structure, Categorisation options for Findings, Actions and Incidents plus any pre-existing checklists. Data Upload: Importing existing data. Installation. Hosted on secure Rackspace servers. Uptime Guarantee. Includes uptime guarantee and software upgrades. Support. Online customer care system. We also understand that sometimes a Fully Customised/Bespoke tailored EHS Management software solution is required. This can be provided in a swift, low risk, cost effective manner using the power of our software platform. Contact us for details. Optial can also provide consultancy and content combined with EHS SmartStart. Country Audit Checklists for Retail, Office and Service industries. Compliance plans such as OSHA, ISO, RIDDOR, COSHH for local & international regulatory requirements. Key Indicator, Risk assessment Health Checks. Offline working, real-time import / export functionality. Specialist provider of advanced IT solutions for Environmental, Health & Safety, Audit, Governance, Risk and Compliance. Optial sits on the same side of the table as the client - a major financial institution.